February 1, 2019 – On every worksite in America, workers can be seen wearing hard hats. The origin of the hard hat traces back to 1919 when inventor Edward W. Bullard introduced it to miners for protection from falling rocks. Now, one hundred years later, head protection is a standard requirement on worksites across America. Not many of us would include Edward W. Bullard in a list of famous inventors, but without his hard hat, millions of workers would be in danger of suffering serious head injuries on the job. Named, the Hard Boiled® Hat because of the steam used in the manufacturing process, Bullard’s hat was manufactured from steamed canvas, glue, leather, and black paint. Construction sites in the 1930s started requiring workers to wear head protection to help reduce the injuries and deaths. 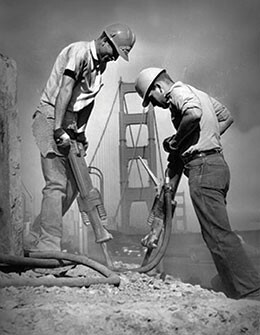 Two of the most famous sites that required head protection for their workers were the Golden Gate Bridge and the Hoover Dam, both iconic historical construction projects in the history of the United States where hard hats were first worn. In fact, while the Golden Gate Bridge was being constructed in San Francisco, Bridge engineer Joseph B. Strauss contacted Bullard to request that his company adapt its hats to protect bridge workers. One of the problems the bridge project faced was falling rivets, which could cause serious injury to workers. The original mining helmet was transformed into a durable industrial hard hat and the Golden Gate Bridge construction project became America’s first designated “Hard Hat Area”. Not until the 1970s when OSHA (Occupational Safety and Health Administration) was formed did wearing a hard hat on worksites become mandatory. In 1970 there were 15,000 worker deaths; in 2016 there were approximately 5,200 deaths, proving how effective and necessary head protection is on the job. The hard hat which revolutionalized the mining and construction industries in the 1920s is today the most recognized piece of safety equipment worn by workers worldwide. Over the years, the hard hat design has changed to accommodate the way workers work. Thermoplastics is the standard material for hard hat construction because it’s easy to mold and shape with applied heat. Now, more innovative hard hat designs are making their way into the industry. These designs are taking into consideration the needs of workers and how they work. Comfort, style, and safety are key to designing a hard hat for today’s workforce. For instance, new head protection models that offer a see-through visor on the bill of a hard hat is one way of allowing workers to see the hazards that may be lurking above them. Changes in hard hat suspensions and brow pads are all new choices workers have when choosing the right head protection for their type of work. Today’s hard hats are designed to meet or exceed the requirements of ANSI/ISEA Z89.1 standard. More than six million hard hats are sold each year to protect workers from the dangers on worksites. Think about all the sites where a hard hat is worn and it’s easy to see why this invention changed the way we look at safety regulations. Wearing a hard hat with other personal protective equipment, like respiratory protection, is a must to help avoid the hazards on the job. The hard hat is still the most important piece of safety equipment available to protect workers’ heads. Edward W. Bullard deserves the credit for improving the safety and lives of all workers for the last 100 years, thanks to his invention of the hard hat. So, the next time you walk onto a worksite remember the many men and women before you that have benefitted from this innovative safety product. Stacey Simmons is the Product Manager for Industrial Head and Face Protection Products at Bullard, a leading manufacturer of personal protective equipment and systems worldwide. Her product responsibilities include Head and Face Protection and Body Temperature Management. Stacey also serves as the Product Chair of the Industrial Safety Equipment Association’s (ISEA) Head Protection Committee. ISEA is the leading association for personal protective equipment and technologies that enable people to work in hazardous environments.